Elderly and disabled passengers could lose vital bus services because of cuts in government funding, councils in England warn. The Local Government Association (LGA) says support for the concessionary fares scheme has been reduced by over a third since 2010. Under the scheme, councils have to provide free off-peak travel for those aged over 62 or disabled. The government says it provides funding to meet subsidised travel costs. Local authorities say the funding from central government for concessionary fares has been cut by £261m since the coalition came to power. Now councils say they are forced to subsidise the scheme, often by cutting back on other local transport services. It is a particular problem for county councils trying to provide relatively expensive rural bus routes and school transport. Some authorities are now stripping back rural bus timetables, or cancelling free travel for elderly and disabled passengers during peak hours. Free home-to-school transport is also under threat in several areas. Leicestershire's Conservative councillor with Cabinet responsibility for transport, Peter Osborne, said: "The local government spending squeeze means what is required by law is undeliverable unless county councils put in extra subsidy. Is it fair that a ratepayer is subsidising what government should be paying for in the first place?" Terry King, 90, joined forces with other residents to hire a bus after services were cut in the Somerset village of Cheddar. She told the BBC: "The Bristol bus, which a lot of us want, was stopped completely. "I organised a bus of my own, and we all pay £5 for a day out shopping, which we are alright about. "I think other people could do the same thing in other villages. "You can't get everything for free these days. I think once the country is doing better then I will fight for getting a free bus again." Oxfordshire, Cumbria, Somerset, Dorset and Buckinghamshire are also looking at ways to reduce the cost of their local bus routes. 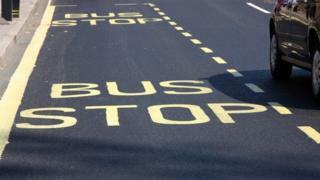 Their plans involve a mixture of cutting school buses and withdrawing less popular routes, the LGA said. Councils say the problem compounded by the fact that demand is increasing. The ageing population means that a third of all bus journeys are by the 10 million older and disabled people who receive concessionary bus passes. Councils are increasingly looking for alternatives to regular scheduled buses - particularly for the more remote villages. Some authorities are promoting car sharing schemes and "dial a ride" community transport services. Councillor Peter Box of Wakefield, who chairs the LGA's Economy and Transport Board, said: "The concessionary fares provide a lifeline for our most vulnerable residents...but it is now under real threat." A spokeswoman for the Department for Transport said: "We know that bus services are vital for many older and disabled people. That is why the right to free travel is enshrined in law, and government provides funding to meet the cost of subsidising offpeak travel for these groups. "In addition, the Department for Transport provides funding to bus operators to help more services run and keep ticket prices down. The current level of this funding is protected until 2015/16."